Dementia is not a specific disease. It is overall term that describes a group of symptoms associated with a decline in memory or other thinking skills severe enough to reduce a person's ability to perform everyday activities. 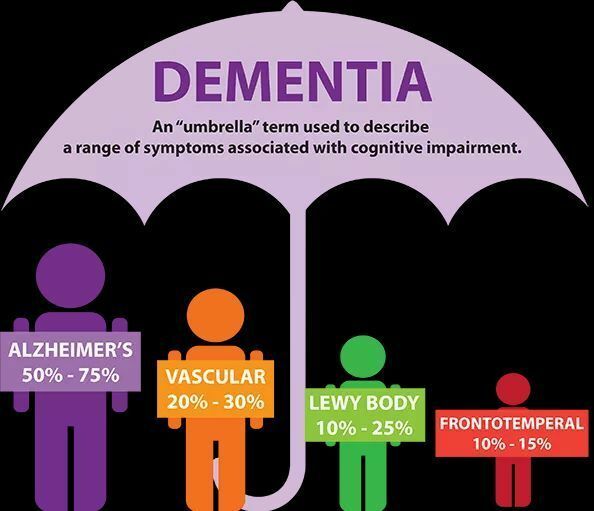 Let us study through this article about causes, symptoms, types and cure of Dementia disease. Dementia is a disease which is caused when brain is damaged by diseases like Alzheimer's disease or a series of strokes. We can say that Alzheimer's disease is the most common cause of dementia but not the only one. Therefore, Dementia is not a specific disease. It is overall term that describes a group of symptoms associated with a decline in memory or other thinking skills severe enough to reduce a person's ability to perform everyday activities. This disease affects about one in ten people over the age of 65 and almost one in four over 85 years. People under the age of 65 are also prone to the disease which is known as early onset of Alzheimer’s. - Problem solving or language and the ability to focus and pay attention. - Even dementia people are not able to control their emotions and their personalities may change. This disease may ranges in severity from the mildest stage when it is just beginning to the more severe stage in which a person is completely dependent on others for basic activities of living. Note: Many people suffer from memory loss but that does not mean that they have Alzheimer's or another dementia. There may be various reasons of having memory problems. When brain cells are damaged then dementia may occur. Due to this damage the ability of brain cells to communicate with each other interferes. This further interfere person’s thinking, behaviour and feelings. It can be understood like this: We know that brain has different parts and each part of the brain is responsible for different function isn't it. When cells in a particular region are damaged, that region cannot carry out its functions normally. Dementia can be caused by a head injury, a stroke, a brain tumour or due to HIV infection. While most changes in the brain that cause dementia are permanent and worsen over time. If certain conditions are traced in a person like depression, side effects of medicine, thyroid, deficiency of vitamins etc. then it should be treated timely. Do you know how human brain works? - Alzheimer's disease which occurs due to protein abnormalities which is characterised by 'plaques' between the dying cells in the brain and 'tangles' within the cells. Person suffering from this disease his or her brain size shrinks. - Dementia with Lewy bodies is a neurodegenerative condition linked to abnormal structures in the brain. The brain changes involve a protein called alpha-synuclein. - Parkinson's disease is also marked by the presence of Lewy bodies. Although Parkinson's is often considered a disorder of movement, it can also lead to dementia symptoms. - Mixed dementia means a person may show both Alzheimer's disease and vascular dementia at the same time. - Huntington's disease is characterized by specific types of uncontrolled movements but also includes dementia. - Frontotemporal dementia also known as Pick's disease. - Normal pressure hydrocephalus when excess cerebrospinal fluid accumulates in the brain. - Posterior cortical atrophy resembles changes seen in Alzheimer's disease but in a different part of the brain. - Down syndrome increases the likelihood of young-onset Alzheimer's. Unfortunately, there is yet no cure for it and scientists are still searching for causes of this disease. If brain cell death cannot be reversed, so there is no known cure for degenerative dementia. Management of disorders such as Alzheimer's disease is instead focused on providing care and treating symptoms rather than their underlying cause. Therefore, symptoms of Alzheimer's disease can be reduced by some medications. If dementia symptoms are due to a reversible, non-degenerative cause, however, treatment may be possible to prevent or halt further brain tissue damage like an injury, medication effects, and vitamin deficiency. - There is no plan and policy in India which targets Alzheimer’s and related diseases. As India has vast number of people who are below poverty line, it is imperative for India to consider putting Alzheimer in health care policy. - Alzheimer’s and related Disorders Society of India (ARDSI) calls for the government to have its plan or policy on dementia which must be implemented in all States and funded and monitored by the Health Ministry. - Do you know that ARDSI has been successful at initiating a Kerala State Initiative on Dementia which is the first public-private partnership for dementia care and awareness? Kerala has the highest proportion of older persons in the country. - It is estimated that 47.5 million dementia sufferers worldwide. One new case of dementia is diagnosed every 4 seconds. There is an urgent need to include dementia as a national health and social priority with provisions to identify dementia as early as possible and have adequate services for its treatment. Therefore, we can say that Dementia disease mostly affects older people but is not a normal part of aging. 1615 Views What is Mission Shakti? 821 Views What does Low Earth Orbit (LEO) mean?